More and more research is being conducted on the well-being of lesbian, gay and bisexual (LGB) — also known as sexual minority — teenagers, but very few of those studies focus on the health of LGB youth who are also ethnic minorities. That omission can lead to wide gaps in understanding the lives of and issues that affect LGB teenagers, particularly teenagers of color, according to California State University, Northridge child and adolescent development professor Virginia Huynh. Huynh and her colleagues — University of Arizona professor Russell B. Toomey, University of Missouri researcher Samantha K. Jones, San Diego State University graduate student and CSUN alumnus Sophia Lee and CSUN graduate student Michelle Revels-Macalinao — recently reviewed 125 publications since 1990 that examined the health and well-being of sexual minority youth of color. Their report appears in the Journal of Gay & Lesbian Mental Health. “What we found is that in the past 25 years, there have been very few studies on sexual minority youth of color,” Huynh said. “The studies that do exist don’t take into account how one identity (sexual identity) might be affected by another (ethnic identity). Huynh said the team focused on the teen years because that is when many young people begin to share their sexual identity with others. “Things like family relationships, love, school achievement and sense of identity are so important during the teen years, but our review documents that we know so little about how sexual minority youth of color experience family, love, relationships or school,” she said. 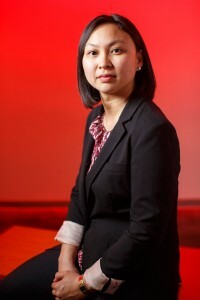 Huynh, who works in CSUN’s College of Health and Human Development, said she was surprised to discover that few people had asked those questions, pointing out that future studies need to appreciate the differences that exist between ethnic communities. “The fact of the matter is, when you have multiple oppressed identities, you might have negative experiences based on each one or a combination,” she said. “The problem is, at the moment, there is very little research out there to provide people with enough information to make generalizations about what it is like to be an LGB youth of color. “We need more studies,” she said.